When Apple decided to remove the headphone jack from the iPhone 7, and iPhone 7 Plus, it raised a lot of questions. The most problematic being – how do you charge, and listen to music at the same time? It seems that the only solution to that, is using Bluetooth headphones. Apple introduced their own solution in the form of AirPods, which, priced at $159, look good, and probably work well. Unfortunately, the AirPods are not being sold, yet, and are probably delayed until January 2017. 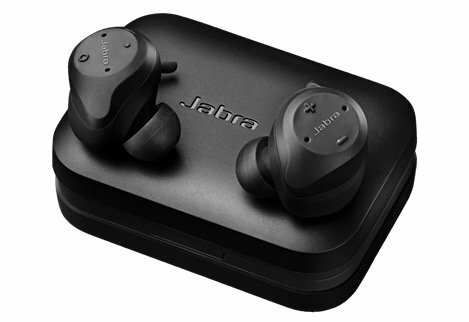 If you’re looking for a great, truly wireless solution for listening to music, these earbuds from Jabra are quite simply the best ones you can get. The earbuds come with microphones in both the left, and the right earbuds. This allows the earbuds to filter out background noise efficiently, making your voice (during calls) clearer. The earbuds are compatible with both Android, and iOS devices, and last up to 3 hours on a single charge. The included charging case can provide two extra charges, allowing the earbuds to be used for up to 9 hours. Also, one of the best features of these earbuds, is that you can choose to wear both of them, or just one, and they will work perfectly. The earbuds also feature hear-through, which can be enabled with the touch of a button. 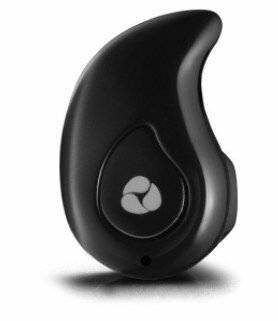 This will allow you to hear sounds from your surroundings, so you can be more aware of your environment while listening to music. 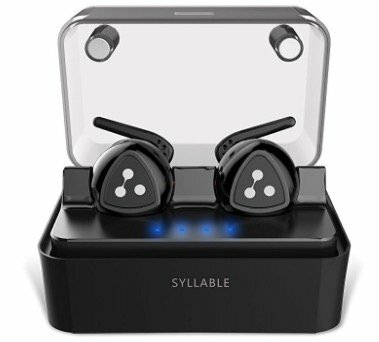 These noise cancelling headphones from Syllable are another great choice you can go with. They feature the latest noise cancelling technology to maximize noise reduction. Also, the two power audio driver delivers crystal clear sound, so you can enjoy your music. The one problem with earbuds this small, is that they can only last for around 2 hours on a single charge. However, the charging box they come with, is capable of charging them up to 6 times, so that shouldn’t be too much of an issue. Along with all that, the earphones are also sweat-proof. The Firegram Mini Wireless Earbud is a very small, lightweight earbud that will fit easily into your ears. It comes with a one-button control, which makes it very easy to operate. Battery life afforded by the Firegram Mini earbud is decent, at 4 hours, along with a wireless range of 33 feet. One thing to note, is that this is a single earbud, and not a pair. However, at the price point, they are definitely worth considering. The Powerbeats3 Wireless in-ear Headphones are another pair of good sounding headphones that you can consider for your iPhone 7. The connect via Class 1 Bluetooth, for stable, and reliable connection with your devices, and allow you complete freedom, whether you’re working out, or simply enjoying your music at home. The battery life afforded by these headphones is simply great, as these can last you up to 12 hours, on a single charge. They can be charged with any microUSB cable, along with the one that comes inside the box. If you’re looking for a great sounding pair of headphones, that are sweat, and waterproof, these are one of the best ones out there. and strong battery life (12 hours), thanks to Apple’s W1 chip. Pairing is dead-simple for iOS users and the headphones also work just fine with Android phones. 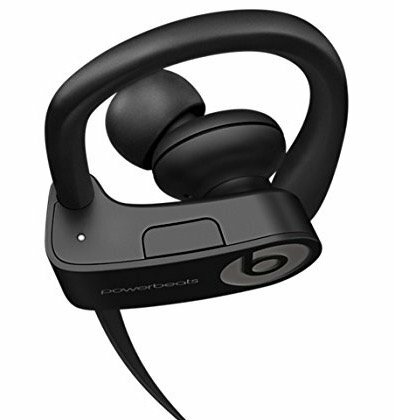 not a major upgrade over Powerbeats2 Wireless. 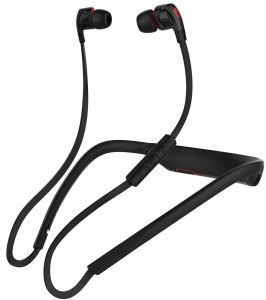 THE BOTTOM LINE The PowerBeats3 Wireless is a decent step up over its predecessor, but it’s no bargain in an increasingly crowded market for wireless sports headphones. 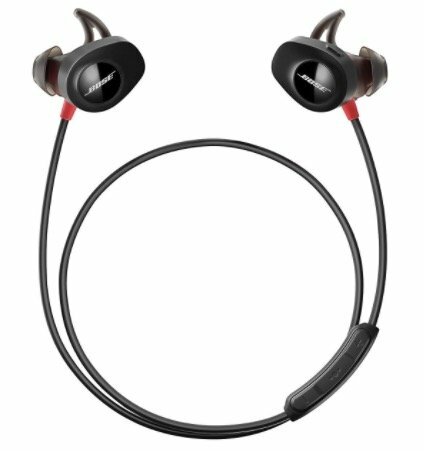 The BackBeat Go 2, from Plantronics, are great quality earphones that use Bluetooth to connect with your phone. They ship with a charging case, which can allow the earphones to run for up to 14 hours. Also, the gel-type ear stabilizer ensures that the earphones don’t fall out while walking. However, they are not recommended for running. The BackBeat Go 2 are constructed with military grade technology, and are sweatproof, and waterproof, so you can use them even for intensive workouts. Useful design touches. Inexpensive, even with optional battery charging pouch. Solid midrange and high-end response. Weak bass. Microphone picks up street noise. 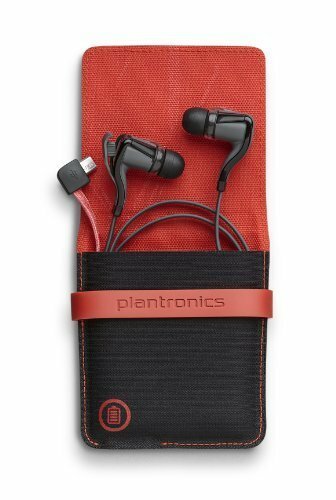 The Plantronics BackBeat Go 2 stereo Bluetooth headset is a small but welcome upgrade to the previous BackBeat Go, and offers a great value despite its light bass output. The SoundSport Pulse earphones from Bose, come with a heart rate monitor built-in, which makes it easy to track your performance when you’re working out. They feature both Bluetooth, and NFC, to pair with devices. You can download the Bose Connect app, which will allow you to get real-time heart rate readings from the earphones. The earphones also work with popular fitness apps, such as MapMyRun, Runtastic, and many more. Skullcandy’s offering, the Smokin’ Buds 2, are another great option to consider. The wireless earbuds sound great (especially the black and red ones), and the sound is very crisp and clear. The earphones also come with noise cancellation capabilities, which are admittedly “just decent”, but should serve users well, unless they are trying to listen to music in a very noisy environment. However, this also means that the earphones are perfect for use on the road, as they will always keep the listeners aware of their surroundings. The battery life of the Smokin’ Buds comes in at around 6 hours, which should prove more than sufficient for most people. Powerful audio performance with massive bass response. Big bass sound comes at the expense of the overall balance of the mix. Mega-bass lovers rejoice—the Skullcandy Smokin’ Buds 2 Wireless is an affordable Bluetooth earphone pair with gobs of low-end. The SoundPEATS Bluetooth headphones come with Bluetooth 4.1 connectivity, along with aptX+ support. They can connect to two devices simultaneously, so you can easily switch between devices, on the go. The earphones last for up to 6 hours on a single charge, and have a standby time of up to 150 hours, which is simply amazing. 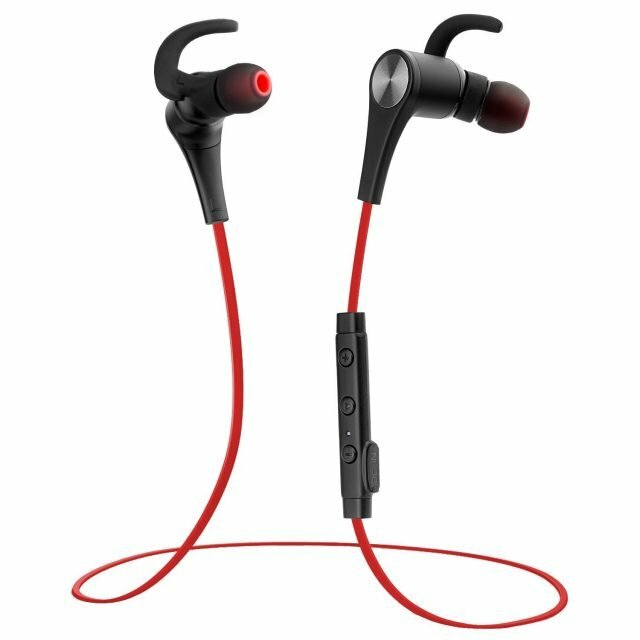 Also, the SoundPEATS earphones are sweat resistant, and can thus be used for working out, as well. They also have an inline mic, as well as volume controls, so you can answer calls directly from the earphones, without having to take your phone out. These are some of the best wireless earphones that you can buy right now, instead of waiting for the AirPods. 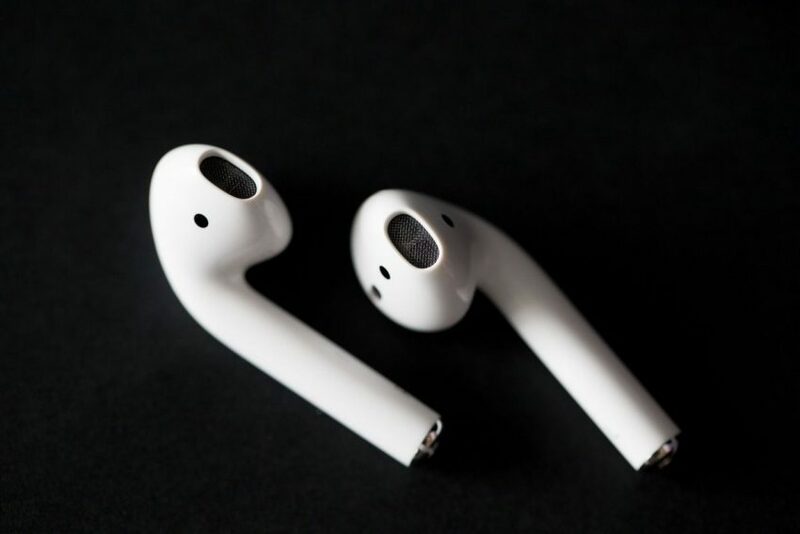 While they don’t offer a lot of the advanced functionality that AirPods do, they will work perfectly fine for the way most people use their headphones. So, if you’re not interested in waiting for the AirPods release date, or if you just don’t like them, these are the wireless earphones you should be considering as your next purchase. As always, if you know of a great sounding pair of wireless earphones that you think should be covered in this list, do let us know about them in the comments section below.